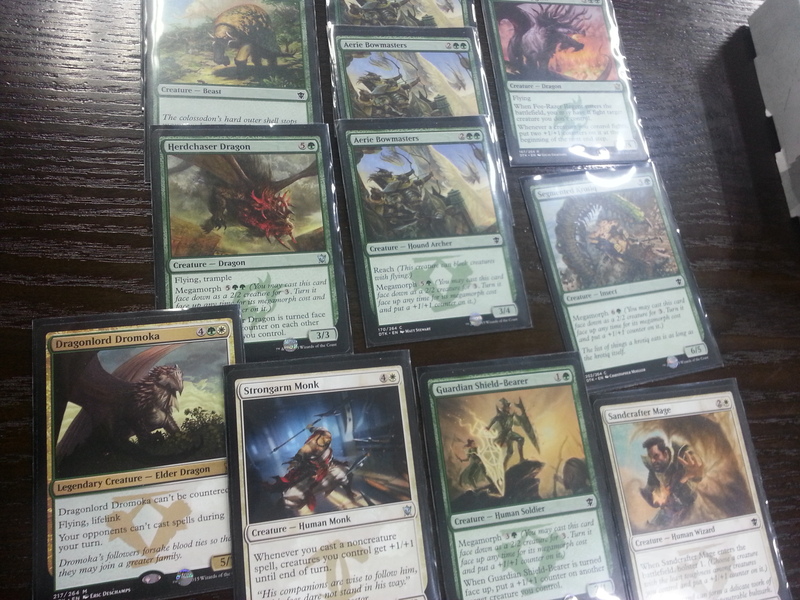 Dragons of Tarkir Prerelease: Dromoka! I have been looking forward to a good prerelease for quite some time. Prereleases are probably one of the best ways to enjoy magic and with the fast pace of standard rotations, it’s one of the few ways to enjoy the new cards that get released. I headed to Divedice in Hongdae, located right off of exit 2. Although I hoped to open a sweet planeswalker like most others, I was quite happy when I saw Dromoka appear as one of the last cards I opened in my prerelease box. It also helped that Sunscorched Dragon made it in my seeded pack. Unfortunately, I didn’t have much in the way of removal besides a pacifism and Epic Confrontation. Usually when I did cast my removal, I was already ahead on board. The big powerhouse for the deck was actually a Colossondon Yearling. It’s impressing power and defense allowed to stop morph rushes and bide me time to cast my dragons. I ended up going 3-1, losing to a devastating Silmugar prerelease deck. My opponent had impressive creatures like Dragonlord Silmugar and Dragonlord Ojutai. Worse, he had sacrifice outlets which weakened cards like pacifism and dodged “losing creatures” to epic confrontation. Overall, the prerelease was a blast and I enjoyed the new, improved seeded pack. 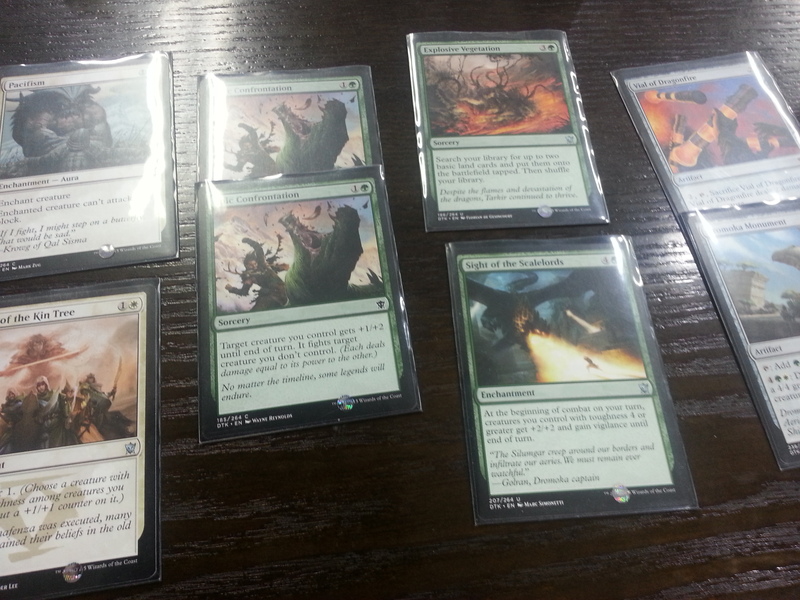 Unlike the seeded packs from Return to Ravnica, these packs were chalk full of colors I chose (all green/white spells). Unfortunately, the rest of my boosters just didn’t have surefire removals. The deck relied heavily on a counters strategy. The more creatures that had +1/+1 counters, the more bonuses you got from drawing cards, tapping blockers out of the way, to pumping up the rest of your army. I also noticed that playing Green/white, I often had to tap out to make sure my big creatures were able to hold down the fort. It was typical for me to cast a small creature turn 2, Colossondon Yearling turn 3, either another morph or a slightly improved giant spider, followed by Sunscorched Regent and any other big beat dragons. I rarely had floating mana to morph my creatures or have room to play tricks without unmorphed creatures around. All in all, I had a great time at the prerelease.